Betwixtmas… that leftovers laden lull between Christmas and Hogmanay when nobody can remember what day of the week it is. Hopefully folk are getting the chance to get out and enjoy the great outdoors and work off some of those mince pies! We can offer winter Munro bagging adventures and winter skills days with more reliable conditions than we usually see on Arran. So if you’ve never used ice axe and crampons before, or simply wish to be guided around the Scottish mountains this season by experienced Winter Mountain Leaders, get in touch. We are still available for days out on Arran, either for wildlife watching or (conditions allowing) winter walking, - so please also get in touch to check availability. Fingers crossed for a good winter season with lots of snowy fun for everyone. In the meantime, enjoy the rest of the Festive Season and have a happy Hogmanay! Lucy: I've been back in the UK for a month and I have to say, it's been a bit colder than I expected! When I left France I was longing for a bit of green and some proper Scottish spring flower after a winter of monochrome but what I got was the Minibeast from the East, and then the Easter Beast. I'm a bit disappointed to say the least! This is me camping in the peak district last weekend, working for Adventure Expeditions. It was cold. Very cold. Amazing work by the young people completing their Gold Practice in these conditions! Anyway, today there was a lull in proceedings. Client Carole came over with her camera to enjoy some of the best of Arran's wildlife. As always, it was dramatic, but made us work hard for our sightings. We got a soaring golden eagle having a bust up with kestrels and buzzards, and then later a couple of otters braving the rough seas. The icing on the cake for me was a male and female hen harrier quartering the moors above the Ross Road. As usual, I failed to take any photos of the wildlife, but I did get a few of Arran looking spectacular in her wintery spring garb. Just in time to make me feel bad about heading back to France at the weekend! Adieu Arran, see you when spring is a bit more sprung. Assessor Helen Barnard and my fellow candidates. Lucy: The exciting news here for us in the French Alps is that I have passed my International Mountain Leader Award! Its been a time consuming and often challenging process, that has taken me just under two years to complete, with two 5 day training courses and two assessments as well as a speed navigation test and months of personal consolidation. Preparation for my final assessment was one of the ulterior motives in our relocation to France this winter. A break in the clouds on Mont Chery. 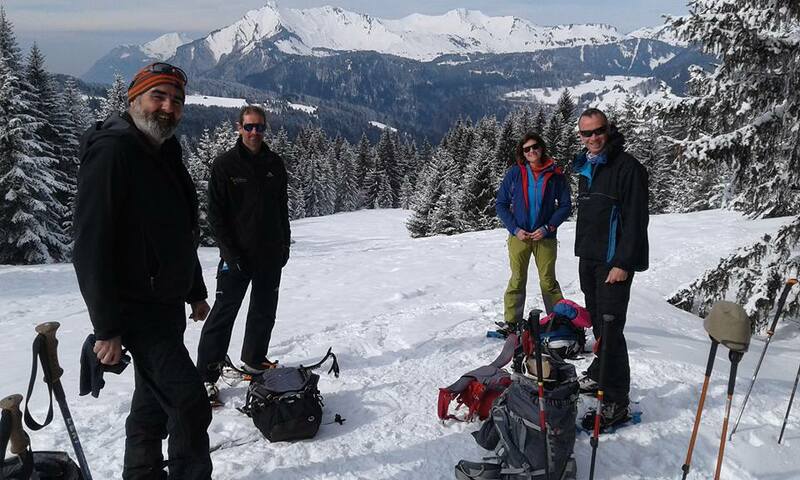 My last assessment began in Morzine a week ago, and I joined 15 other candidates and four super professional Plas Y Brenin assessors for five days of navigation, digging in the snow, avalanche transceiver searches and nature appreciation. The assessors kept us busy, scrutinised our skills, and gave us plentiful opportunities to demonstrate our knowledge. Thank you PYB instructing staff: Helen Barnard, Mark Tennent, Helen Teasdale and Rob Spencer. Whilst much of the IML award involves taking the skills that I've developed as a working mountain leader and applying them in an international setting, I've also learned absolutely loads. Emergency summer rope-work at this level can be more complex, and there is an expectation that IMLs will be slick and safe in dynamic situations. My understanding of the alpine snowpack and avalanche avoidance has increased exponentially (this is a subject where there is always room for more learning), and I've deepened my understanding of the flora and fauna of Europe. The best thing is that I've also had some awesome adventures on the way. The key for me I think was having a supportive community of fellow candidates to train and practice with over the last year or so, and ample preparation time to build up my experience whilst out here in France. Huge thanks to everyone who has joined me on the journey. Sub optimal conditions above the Col d'Encrenaz. Looking ahead, I'm excited to be going home to Scotland next week and returning to the mountains that I love the most on Arran. Nature is best for me when it's on my own patch, with birds, mammals and plants that feel like old friends. However, I'm also blessed that this new qualification is going to bring me lots of thrilling work in Europe and the next few months are looking busy. I'm raring to go! 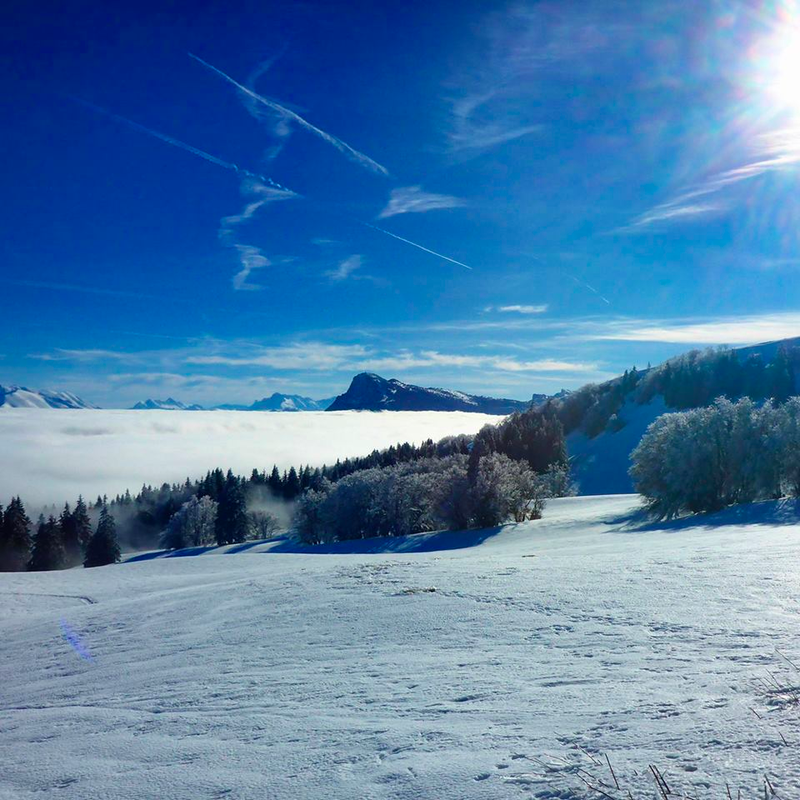 Lucy: We've heard a rumour that has travelled all the way from Scotland to le Bourg d'Oisans... Apprently there has been a White Christmas in some parts of the country... We hope that many of you have been able to get out and enjoy the snow, as we have over here. Today sadly, it is mild and raining so we are hiding at home. Above the house they are blasting loose rock to clear a road that was blocked in the last big storm. Tomorrow another epic snowfall is forecast. I've been absolutely blessed with a fantastic welcome and a great new snowshoing companion. Kirsten and I made the most of the interim good weather over the weekend in the run up to Christmas. On Saturday I was a guest of the Grenoble-Oisans sector of the Club Alpin Français on one of their regular saturday meets. 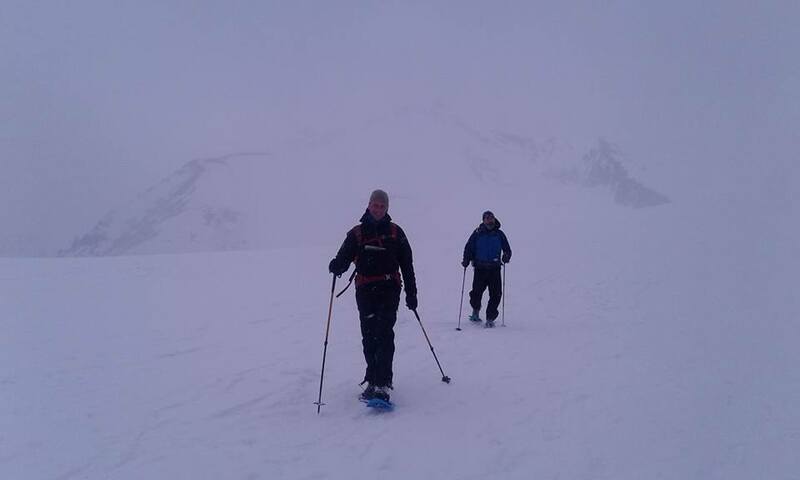 This active club enjoy a lot of Snowshoeing and Kirsten is a regular particpant. 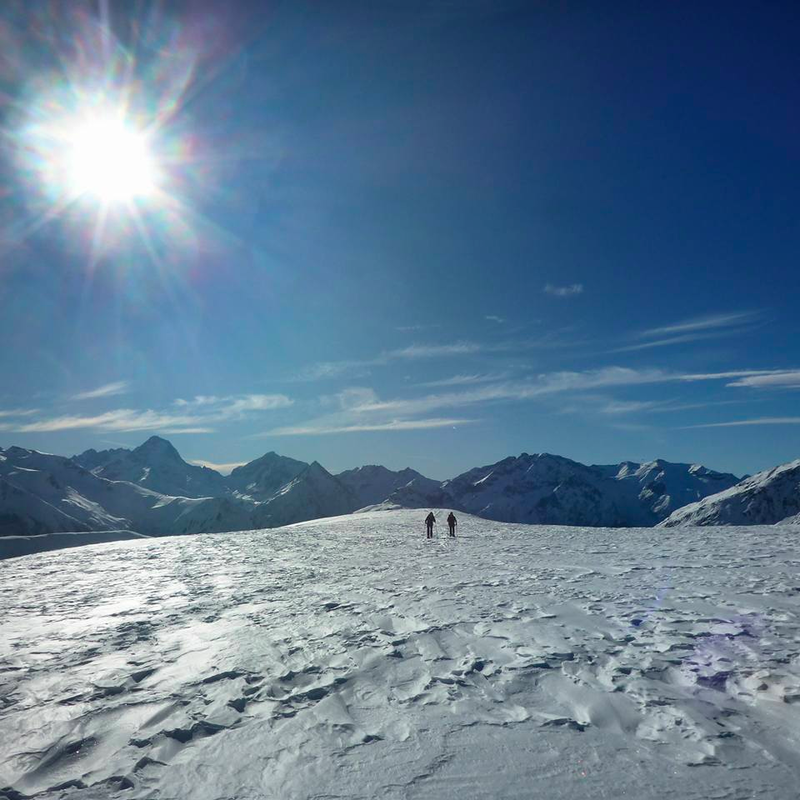 On this occasion we met on the outkirts of Grenoble and headed in convoy up to Engins, in the Vercors Massif, for a snow shoe hike up to the plateau above Sornin. As we set off the mist hung thick in the valley and it was a dark and depressive atmosphere in the forest. It's quite a pull up to Sornin but once above the hamlet the mist began to disperse above us, and it wasn't long before we popped out of a cloud inversion in to brilliant blue skies. We paused at a chalet to "casse le croute" and also for some transceiver/probe/shovel practice, with the wise Francis patiently coaching us all on our technique. After lunch we continued in a circuit through the woodland on the plateau before eventually descending in to the mist once more. For me, this was an excellent experience- once more I was made to feel very welcome, and I enjoyed practicing my dodgy french on the group. It was also very interesting to see "how the locals do it", and I am grateful to Francis for sharing his knowledge and experience. The following day Kirsten and I were a little tired! However, we managed to muster up some energy and Kirsten skillfully drove us up the steep snowy road to Villard Reymond from where we could easily access the small but steep little summit of Le Pregentil, that looms above the valley where we live. It was late afternoon, the sun was beaming at us from across the mountains, and we lingered for a long time on the summit taking it all in. Yesterday of course was the big day, and we decided to spend the daylight hours outside, knowing that it would be the last good day for a while. Wally and Lee joined us for an ascent of La Quarlie, a 2322m summit above the village of Besse with incredible views of Le Meije. The sun beamed down on us and at times it was so hot we felt we were snowshoeing in the Caribbean not the Alps in December. The Quarlie itself is a big rounded lump, dare I say it a slog, nevertheless dwarfed by everything else around it. Again, we lingered on the summit, and the sun was setting as we raced back down to Besse so as not to miss our Christmas Dinner. The coming week looks a bit mixed for us out here, with bands of rain and snow coming through and topping up the mountains with their winter garb. We hope that all our friends and clients have had an enjoyable Christmas, with lots of time to spend with family, including some time outside having fun. In the closing days of 2017 we are reflecting on a busy year for us, and to looking ahead to perhaps our busiest yet to come. We would like to thank our customers for choosing to book their outdoor adventures with us and to wish them all the very best in this festive season. Winter is off to a flying start! On Sunday we were out on the hill with our friend Kirstie and her wee search dog Cailleag, looking for some snowy fun, and we were certainly not disappointed! We took the steep path from Corrie, in to Coire Lan, and then up the headwall towards the bealach between North Goatfell and Mullach Buidhe. The snow lay deep, but not particularly crisp, more deep and a bit sticky... Once on the ridge the wind began to blow. We wrapped up warm, actually quite excited to feel the nip of winter after so much rain, and headed along the ridge towards Goatfell. We took the traverse path that avoids the rocky scramble of Stacach ridge. This is not always the easy option as is also potentially quite tricky in snowy conditions as it lies in the lee of the ridge and can sometimes be buried in snow. However, prevailing winds have been northerly recently and the ridge was mostly quite well scoured. It's worth mentioning that although the deeper pillows in the sheltered bits were well bonded this time, retracing our steps is an option we always have in our minds on this route in winter. We reached Goatfell summit and were delighted to find another friend up there- Zabdi of Flying Fever Paragliding School (on foot for a change). Arran is a beautiful place, especially under a blanket of snow, but it's the people that really make it special. I absolutely love this place and am going to miss home like mad this winter. For more pics of our adventures, check out Kirstie's twitter feed. She's a talented photographer, and her pics really do the day justice! It's not too late to book your winter adventure on Arran. 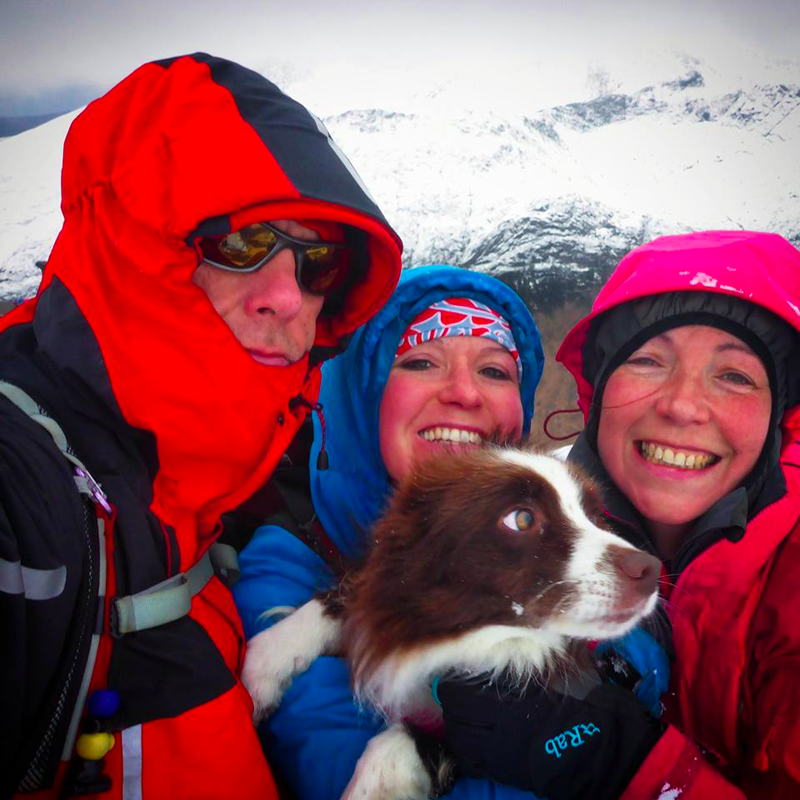 Lucy is a qualified Winter Mountain Leader and has some availability over the next couple of weeks. The forecast is awesome, so this is a great opportunity to see the mountains at their best! Lucy: It's been a long damp dark autumn, and the snow has been slower to arrive than some years, but the mainland is at last looking persistantly wintery and there is snow in the forecast for Arran towards the end of the week! Yesterday I was in the east of Scotland catching up on some hill time with my friend Jen. Jen who is normally unstoppable, is recovering from injury so we picked a relatively easy day that we could adapt and make longer if we wished. The munros to the east of Dalwhinnie fitted the bill perfectly, with a land rover track from roadside to ridge, and a gently undulating plateau to explore. We targeted Carn na Caim first. It's a steep climb up from the road but not difficult and before we knew it we were away from the hustle and bustle of the A9 and enjoying the open feel of the heathery plateau. Visibility was mostly good, but a few whisps of cloud played with us from time to time. Crampons were not needed, but it was bitterly cold. There was a dusting of snow, the ground was mostly frozen, and the light was gorgeous. We made short work of Carn na Caim, and feeling strong, headed for A' Bhuidheanach Beag. It wasn't long before we were congratulating ourselves on the second summit of the day and heading down. All that remained to top off a perfect day was to grab a brew and a bowl of soup by the cosy fire at Dalwhinnie's Snack Shack. Snow is coming to Arran in the next few days so give us a shout if you fancy a guided day in the Arran hills this weekend with a Winter Mountain Leader. If you also fancy a mainland Winter Munro Day, we are taking bookings and enquiries for March- just get in touch and we will endeavor get back to you straight away. The first snow is dusting the summit of Goatfell, and on the mainland, the hills are starting to look genuinely wintery. With the change of season, it is time to update our clients and friends with our winter availability and accordingly, announce some big news about our own plans. In short, we will be spending much of the season in the French Alps! This is obviously very exciting from a personal perspective, but will have a knock on effect for clients for which we are very sorry. We won't be available for bookings from the 10th December until early March. 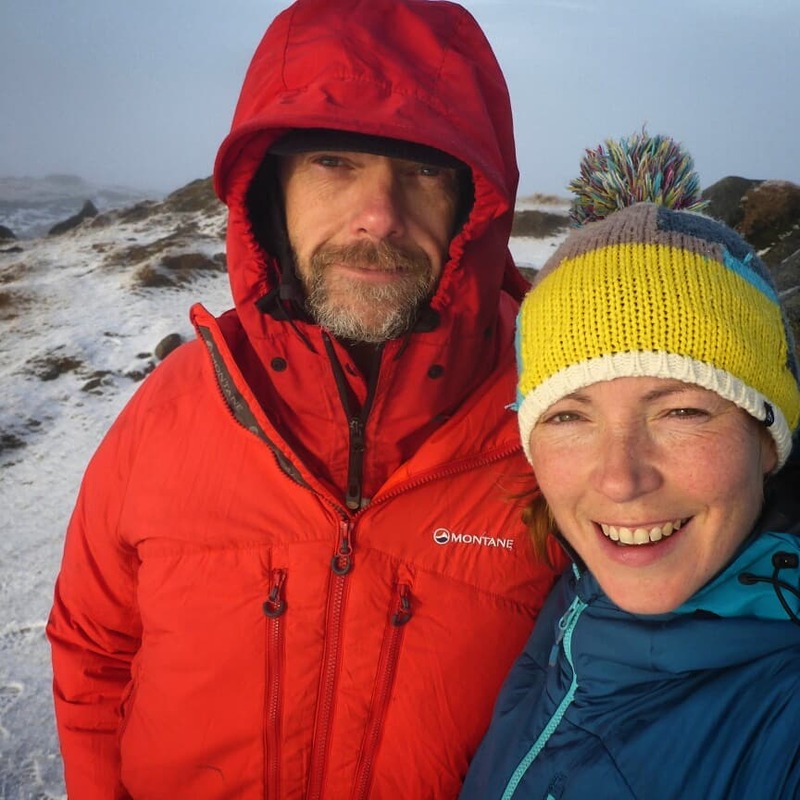 Wally is expecting to be staying out in France until the end of April but Lucy will be back to grab some proper Scottish winter fun from the beginning of March. She already has bookings for winter mountain work on the mainland and is taking bookings for mainland winter munros throughout March. However, if you are keen for Arran wildlife watching or an Arran mountain day in March it is still worth getting in touch to check availability. Looking ahead to Summer 2018 (May onwards), we will start taking bookings for these dates in the New Year. We realise that this may be a little frustrating for those of you who wish to get in early with bookings and appreciate that we book up fast, but this is due to the large amount of schools/contract work that we do. This can block up weeks at a time, and is an important part of our work which we enjoy very much. Sadly we don't yet have these dates firmed up, and would absolutely hate to take your booking and then cancel you further down the line. We hope you understand that your bookings are just as important to us and would be delighted to hear from you in the mean time to chat about options and ideas for your day out on Arran. Finally, we hope you are looking forward to winter as much as we are. It's a brilliant time for watching wildlife and getting out in to the hills. Don't forget your head torch as the nights are drawing in, and pop a few extra layers in the bag! Lucy: I was working for West Highland College UHI with the 3rd year students on the Adventure Tourism Management degree today. This was a revision day for them, looking at a range of winter skills and risk management in preparation for an expedition later this month. The team led me and each other up through steep ground on the North Ridge of Stob Ban. We enjoyed fun scrambling, and a chance to look at movement techniques and discuss how you would protect less confident people on the steeper sections. The descent to the bealach above Coire a Mhusgain was also fairly steep with wet slippery snowpack that needed careful footwork to descend safely. We saw lots of avalanche debris on NE facing slopes and big cornices on north facing aspects. A personal day climbing out east for us today, which paid off with a fun outing on the Mess of Pottage in Coire an t-Sneachda in the Northern Cairngorms. We approached the Coire with fairly open objectives but it quickly became clear that the most straightforward option with the snow (esp cornice) conditions would be a climb on the Mess of Pottage. We headed for Hidden Chimney, a superb route that we have done before and knew would be good value. However, the route was busy with several parties and a with a bit of a bottleneck developing in the chimney we headed out right on to mixed ground. A series of steep litte steps and grooves at about grade II/III (a wandering line that we think is the harder variation Jacob's Edge? ), brought us to the summit in good time. Snow was lying deep on the easier angled terrain on the route, and there was no ice to speak of. Happily there was lots of gear to be found to protect the steep sections. Great views from below the cloudbase on Ben nevis. Lucy writes: Since Thursday I've been immersed in a dense little block of freelance work of the type that is the standard bread and butter stuff of the jobbing Winter ML. On Thursday and Saturday, I was working on the "tourist path" of Ben Nevis for West Coast Mountain Guides and yesterday it was the Ptarmigan Ridge of Ben Lomond for Abacus Mountain Guides. Both companies are well respected and highly professional outfits operating out of Fort William, led by super experienced local guides, and I'm very pleased to be on their books as a freelancer. Getting to the point where I am using my Winter ML Award in this way has not always been straightforward. I was warned when I began the qualification years ago that there isn't much work out there. It took me a while to get my foot in the door with a few companies, and I've had to gamble quite a bit, laying out for accommodation in the Highlands with no guarantee of work. This winter, chracterised by poor conditions and lack of snow, it's been hard at times to keep the faith. However, when it comes, it is definitely the most rewarding and satisfying work that I do. Deep snow on the upper slopes of Ben Nevis. Both Ben Nevis and Ben Lomond attract a wide range of visitors, from experienced Munro baggers to folk out on their first ever mountain walk, and some might even consider these peaks a little dull. However, in winter, they can be serious undertakings. On Ben Nevis this week I've encountered the "Full Scottish" platter of strong winds, blizzards, and visibility so bad that even the summit marker cairns are hard to find without a compass. On Thursday I broke trail almost from the snowline to the summit. I used all my navigation skills even though I was on a summit plateau that I know like the back of my hand. The sense of achievement of a job well done at the end of a day like that is immense. I was back on that same plateau on Saturday, the vis only marginally better, but thanks to two determined clients, keen to lap up as much winter experience and knowledge as possible, I did not feel at all jaded in my work. I love meeting people who are just beginning to fall in love with winter, and am honoured to have a part to play in their journey. 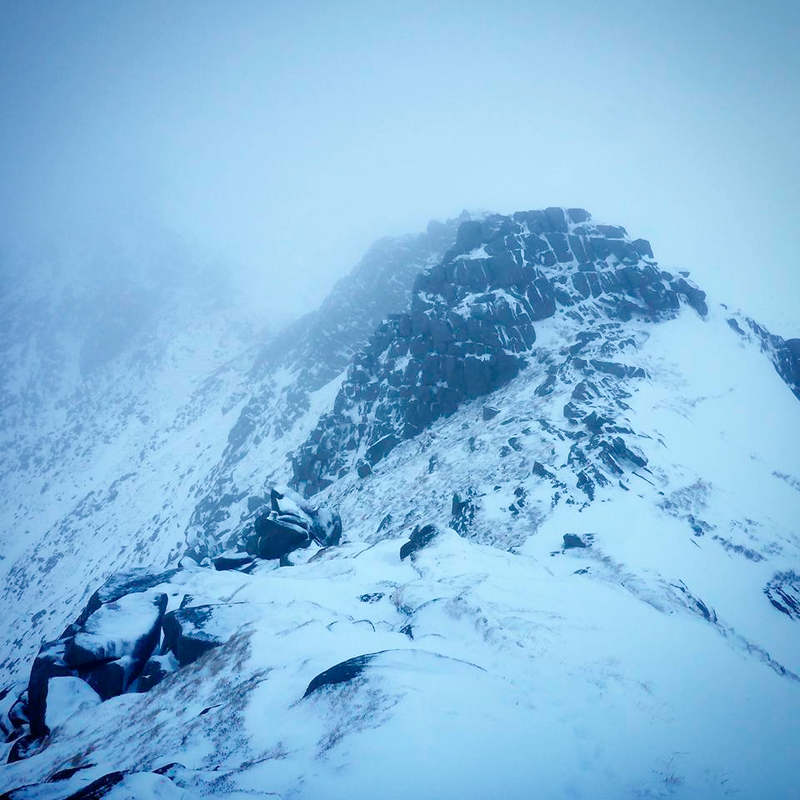 Yesterday on Ben Lomond, the conditions were a little quieter, but on the steep Ptarmigan ridge, crampons and ice axe were essential for safe progression. My clients were super keen, super psyched, but with no winter walking experience. It was brilliant fun teaching them how to use the kit, seeing their big grins as they stomped and kicked their way up the snowy ridge. At the top, a cloud inversion, and that rare sight, a brockenspectre, an angel in a rainbow, waiting for us. The delight in these things is as real as happiness can ever be. All three of us, clients and leader, feeling alive and filled with joy at a day in the mountains well spent. I began this season on a training course in the Alps, and it seemed a far cry from the wild weather and unreliable conditions of Scotland in winter. I wondered if I was missing a trick by spending my time fighting spindrift and gales, rather than swishing through Euro powder. Now, as the first signs of spring are creeping in to the glens, I'm sure that there is nowhere I would rather be working than the West Coast of Scotland. Here, in a typical day, even when I'm repeatedly doing the same routes, I'm using every skill in the box, to coach, inspire, and take care of people in some of the most challenging and exciting conditions out there. Its a massive cliche, but I absolutely love my job.